It looks easy, right? 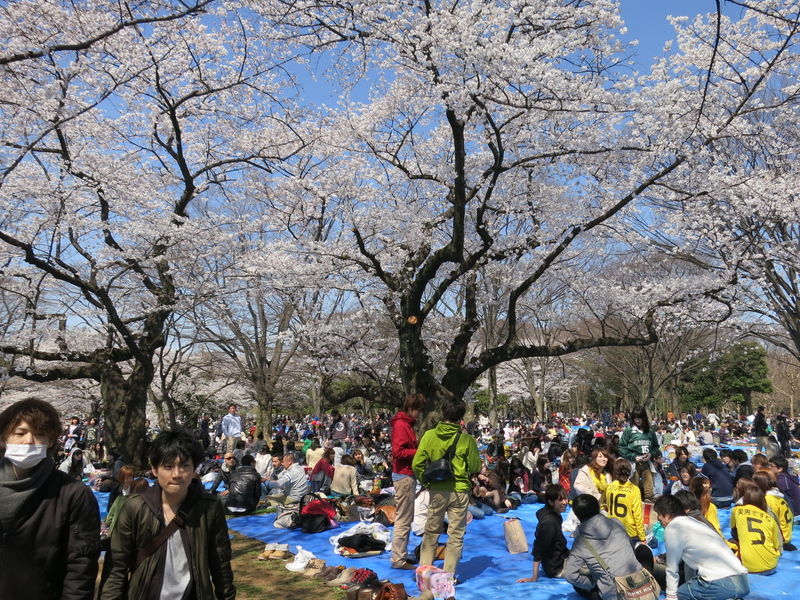 Meet friends at park, spread out tarp, drink beer, admire cherry blossoms. But o-hanami parties are fraught with hidden dangers. Allow me to save you from certain disaster. Be sure you tote along something to read while standing in line for the bathroom. Recommended titles are War & Peace, The Complete Works Of Charles Dickens, and (for those of you who like nonfiction) The Origin Of Species. Because of the Bathroom Issue, the goal of all veteran o-hanami partiers is maximizing drunkenness while minimizing making it to chapter 27 in any of the above books. Drinking slowly, yet relentlessly, seems to be the preferred method. The day after is the recommended time. It’s easy, because after 8 hours of snarfing down o-hanami snacks, you will wake up the next morning swearing off potato chips, octopus balls and alcohol FOREVER. Yes, you must remove your shoes before setting foot on The Tarp. What are you, some kind of barbarian? Origin of Species!?! Ha, I love it! Yeah, the bathroom line is definitely the kind of environment in which only the strong survive. To funny!! Thanks for the info; my goal is to attend one of these.